Farmstands are opening up throughout Cheshire County. The delicious greens & other veggies being purchased for your businesses, schools, institutions, restaurants and camps can be purchased direct from the farms on our list at a location near you. Make the connection by buying locally! Cool weather is liked by leafy greens like spinach. Since we seem to be getting our fair share of rain let's make the best of it and cook up some Cream of Spinach Soup! 1 In a large saucepan over medium heat, sauté onion in butter for 3 minutes or until limp. Add potatoes, chicken broth, water, and bouillon cubes. Bring to a boil. Reduce heat to low, cover and simmer for 20 minutes or until the potatoes are tender. Add spinach and cook for 2 to 4 minutes longer until spinach is tender. 2 Working in batches, purée soup mixture in a blender. Return to saucepan. Whisk in half-and-half, salt and pepper. 3 Over low heat, bring to just before simmering. Whisk in the sour cream. You may want to use an immersion blender to get the sour cream fully incorporated. This soup can be served hot or chilled. Garnish with chopped chives, sprinkles of allspice, or a dollop of sour cream. Our market represents many of our Cheshire County Farmers by providing a place to market their Farm Fresh products to the schools, institutions and businesses within our county. Creating a simpler way for buyers to purchase local products. 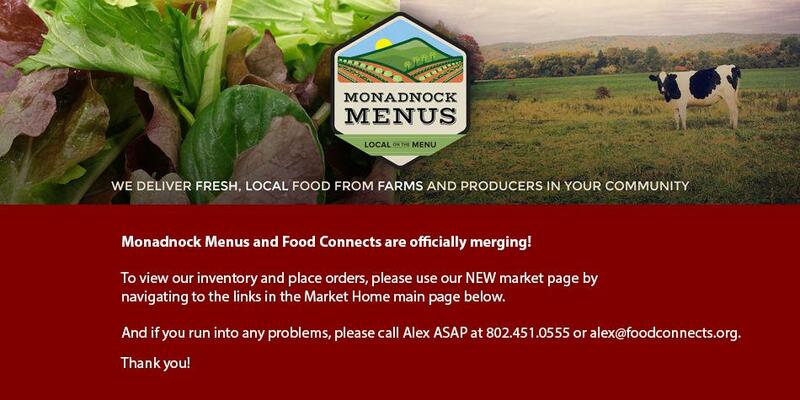 Buyers go now to MONADNOCKMENUS.ORG and support your local farms by placing an order! Bagels make a great base for a healthy, fresh veggie sandwich! Elm City makes their bagels fresh that's why you have to order 72 hours ahead! Fresh spinach is high in iron and loves the cool weather we have been experiencing. Fresh spinach makes a great base for a variety of salad combinations! Partnering with the UNH Cooperative Extension builds community and important collaborative decison making within our county and state.